It's Friday night and it is pouring with rain. Would you let a bit of rain spoil your fun? Of course not. 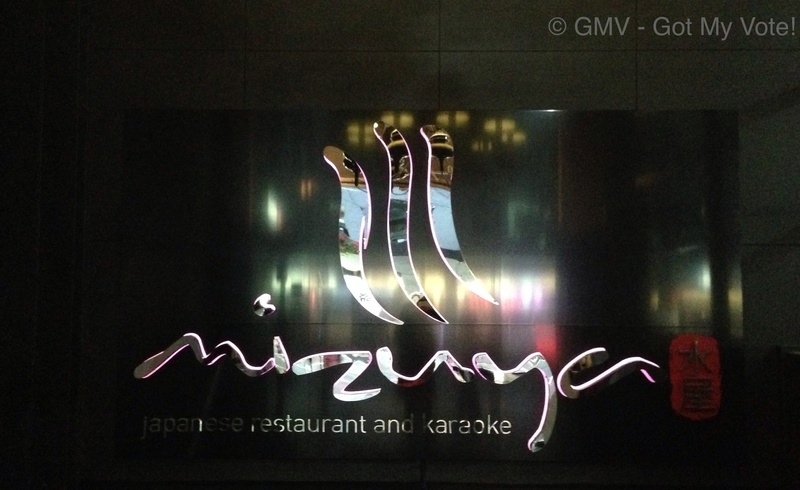 Mizuya is the perfect Friday night-out venue. 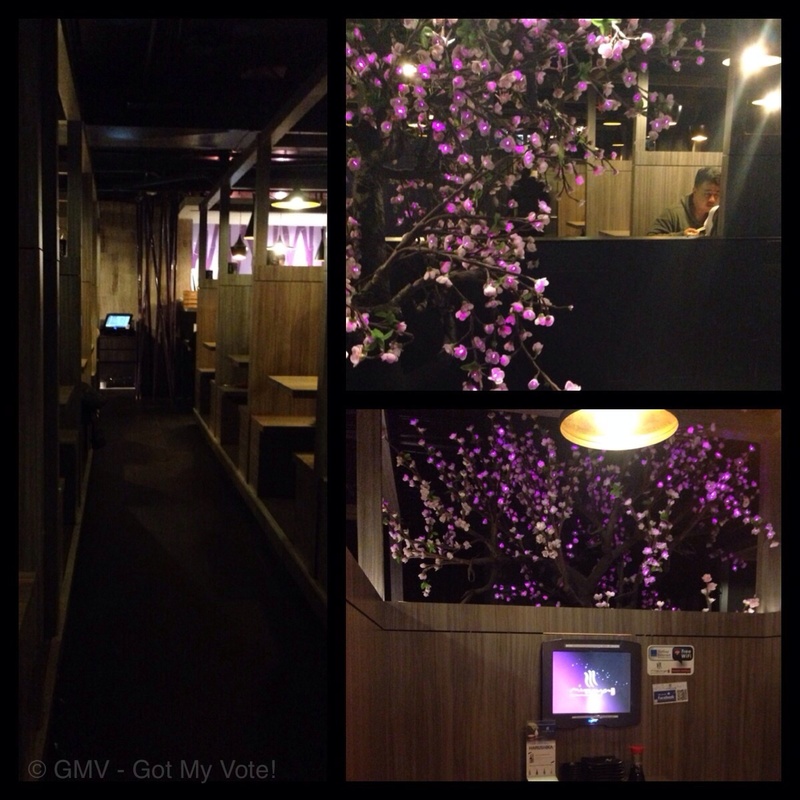 It is a Japanese Izakaya combining casual restaurant dining and private Karaoke rooms. It is located at the basement level on George Street, directly opposite the Event cinemas. With numerous public transport facilities at the doorstep, you can really enjoy your Friday night drinks without having to worry about getting home later. On this occasion, there was no karaoke from us as we ventured down the basement just for a quick light meal. Tonight, we want to have some nibbles while waiting for other friends to arrive. If this is your first time here, these assorted platters are good choices to start-off. 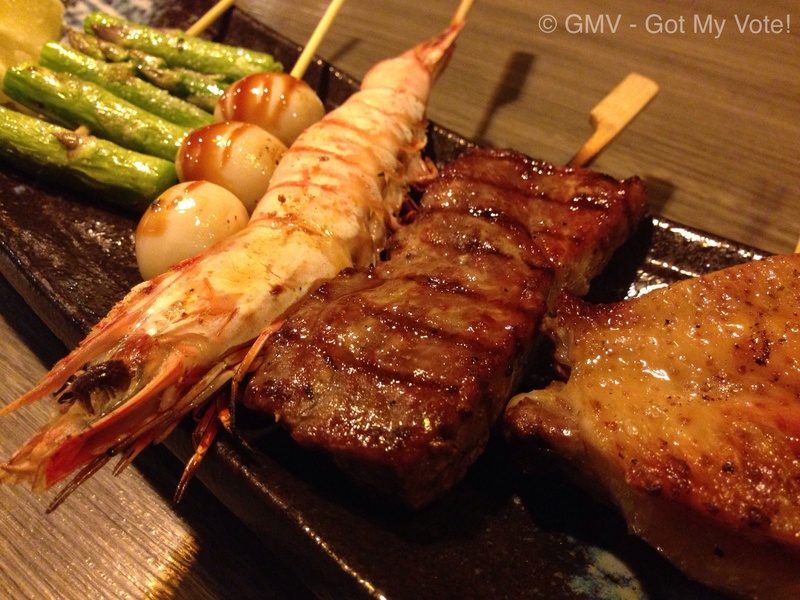 We've ordered the Mixed Grilled Kushiyaki. It was one of our favourite dishes here simply because they provided a good 5 pieces mix-n-match. The beef steak skewer was soft, tender, melts in your mouth; the quail eggs was popping delicious. The chicken wing was butterfly-cut and looks very gourmet. 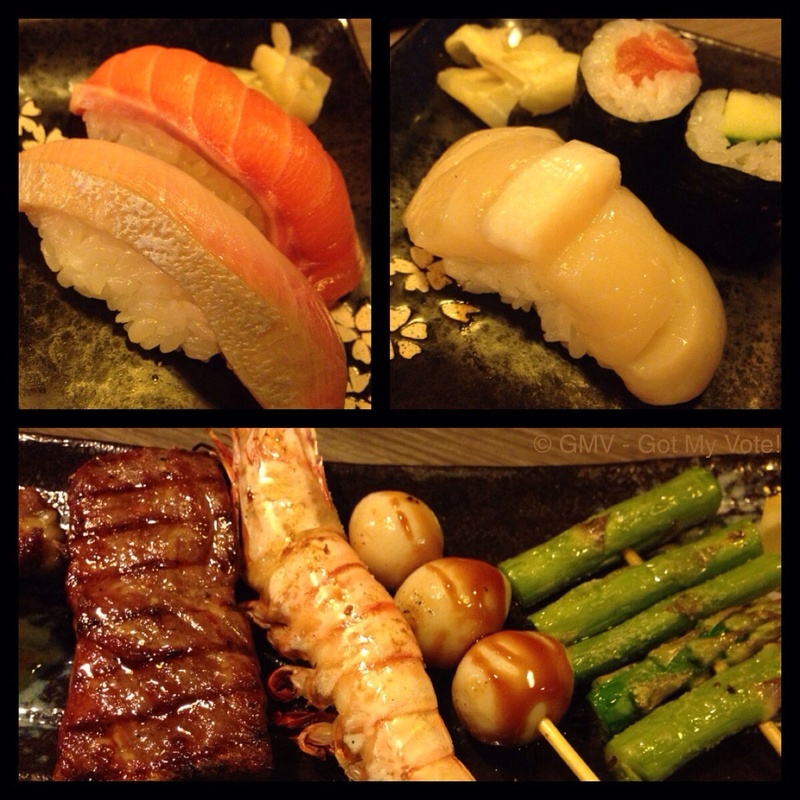 I especially liked the large salt and pepper king prawn and the asparagus skewer with a hint of smoky taste that got me drooling every time. We also ordered the large mixed sushi platter to share. 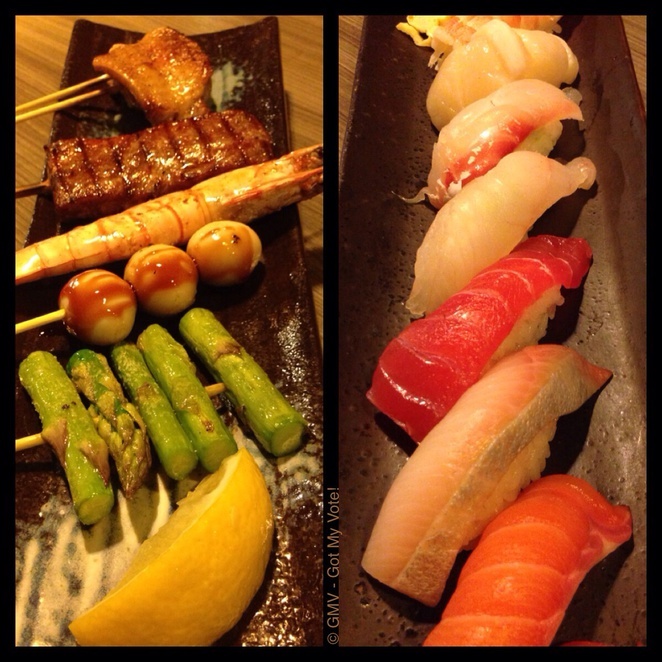 It was elegantly served on a long platter and each sushi looks amazingly delicious. It was dark and swanky once you stepped into the Basement Bar and Dining area. Electric purple lighting flowers were everywhere. We were promptly shown to a small booth separated by tall wooden partitions which allow a great feel of privacy and intimate conversations. Mizuya has a fun, novelty, touchscreen ordering system. Well, it was fun for the first-time. Basically you view the menus on the Touch-screen, order and confirm your selections. Be warned, there is no-change-of-mind once you've confirmed. It is user-friendly and convenient which makes it even easier to overspend and order more than your stomach can handle. Since it is not our first-time here, the novelty has already worn off. Particularly, the annoyance to hurdle on top of each other so we can see the menu description; the malfunctioning of the touchscreen and half of the dishes we wanted weren't on the system. 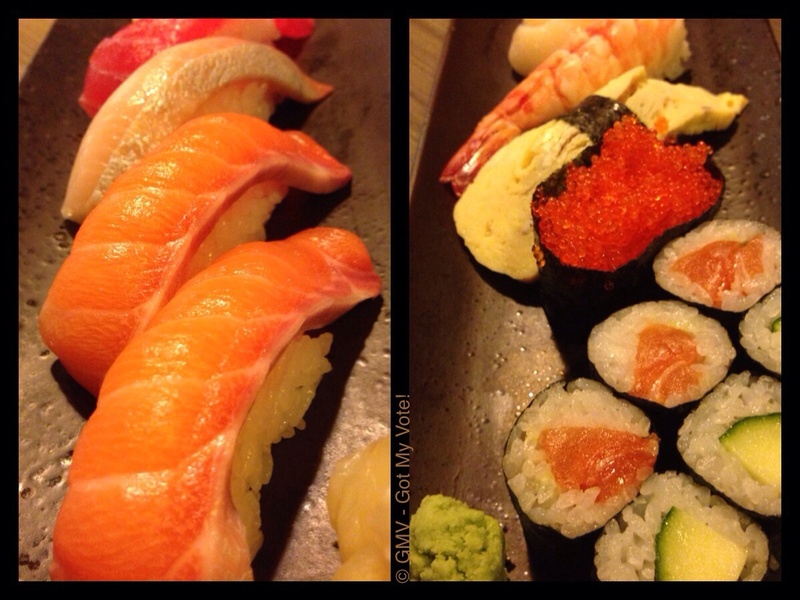 The sushi was fresh and tender. I found the overall quality is above average but the quality is not the best. 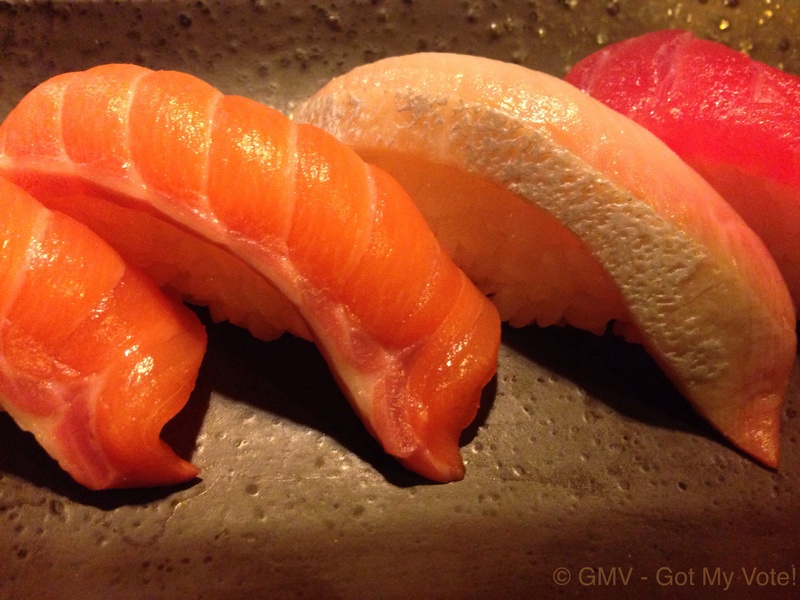 Apparently Mizuya also run Sushi Master Class on the side. We think the mixed platters offer the best value here. All other menu dishes are very small portioned. Each unit price around $7-$20 mark. This may not seem much, but after a couple of dishes and some drinks, they all add up. The food here is great but slightly more expensive and you can get the same great quality elsewhere for a fraction of the price. A futuristic feel with a vast range of Japanese food style - Sushi and Sashimi, Kushiyaki, Rice and Noodles, Hot Pot and of course alcohoic and non-alcoholic drinks and desserts. Afterward you can retreat into one of the karaoke rooms and sing like you are on The Australia's Next Idol. Expect loud and merry conversations, a good atmosphere, a unique table service and freshly prepared dishes.